You are here: Home › #oklaed › The Year in Review – What a year 2014! 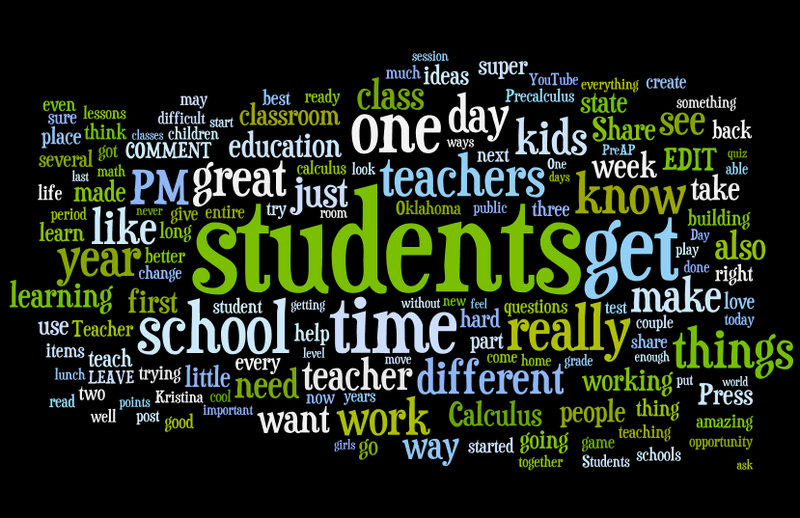 This is a Wordle of everything that I blogged about this past year – guess what word came up most frequently?? Happy 2015!! I hope it goes super #Amazeballs! This past year, I had 8,900 views – mind blowing to a guy who is trying to share his love of teaching a passion for learning!! There were 46 total posts that covered everything from legislative issues, gamification, flipclass, the ISTE conference, and my passion for teaching (my most popular post of the year). Visitors came from 69 different counties! And participating in @EdcampStilly led to the awesome opportunity to write an article for EdSurge.com! What a year! This year promises to be much different for me and what I will be blogging about. Some of my more popular posts last year were rooted in the crazy political game that education in our state has turned into. I am going to try and limit these posts and trust others: Oklahoma Education Truths, View From the Edge, Blue Cereal, Brett Dickerson, and Jason James for those types of posts. Omission from this list is accidental – please add the people you read most in the comments! My goal is to blog more frequently about great things to try out in the classroom – real life, real practical, real cool, and real fun! I want to increase the collaboration of teachers across districts, states, and nations. Foster a place where wonderful ideas can be freely exchanged, where we teachers can put all of our wisdom together and share what we have done with others. Teachers are great at “stealing” an idea and tweaking it to fit their personality and community. Lets tear down some of those walls that fragment and separate us!! In a first step to do this, follow the Facebook Community Teaching From Here. Please borrow, please steal, but most importantly PLEASE SHARE! Without your amazing ideas, nothing happens. There comes a point when you have to quit being a consumer and start being a contributor. It is important to push yourself and get out of your comfort zone – nothing great ever happens when you don’t try and fail and try again (Failure is an Option). Have the courage to do something different – tweak it, make it better. Grow as a teacher so that your students benefit. For me, this means leaving the high school classroom. A place I have been for my entire teaching career – almost 20 years. I am now moving to Oklahoma State University to pursue a PhD in Educational Technology and teach as a graduate assistant. Why? Because this will push me out of my comfort zone. Because this will give me the opportunity to help teachers in radical ways. Because I don’t ever want to QUIT LEARNING! Thanks for reading, thanks for commenting, thanks for being a teacher! One Response to "The Year in Review – What a year 2014!" Well, I am not an educator (well, I was once a natural child birth teacher! ), you never cease to amaze me. spread your skills around the university setting.